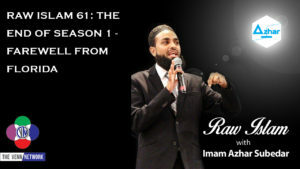 This week on the Raw Islam Podcast with Imam Azhar– a 2017 Podcast Award nominated podcast, the team wraps up what they are lovingly calling season 1. The Imam is getting ready to take a new position as a mosque, quite literally, across the country, and B.C. has some upcoming travel to places where the internet does not reach and adding to all that it will soon be Eid Al Adha…our team gets ready to put a wrap on season 1. Imam Azhar reflects on his schooling and the dua that he made upon graduating, which was simply that he would like to go where he is needed. Growing up he was blessed to have access to scholars, and he understood that not everyone in the world has that. It was with the dua that he found himself in Florida where he was became the Imam at a mosque in the Tampa area. And while his blessings were many while working there, the time has come for him to on to other opportunities. And here he announces that he will be taking a position as the Imam as the Islamic Association of Collin County Mosque in Plano, TX, or the IACC. This episode gets a little emotional as the team, and the live audience shares their good buys and gets ready to take some time off.